Under The Skylight ⋆ Michael Criswell Photography "Theaterwiz"
A look from under the Skylight in the Texas State Capitol Building extension, this is the hallway leading to the four-story open-air inverted rotunda. I loved the lines and the colors in the hallway. The extension was completed in 1993 and is very fun to photograph. 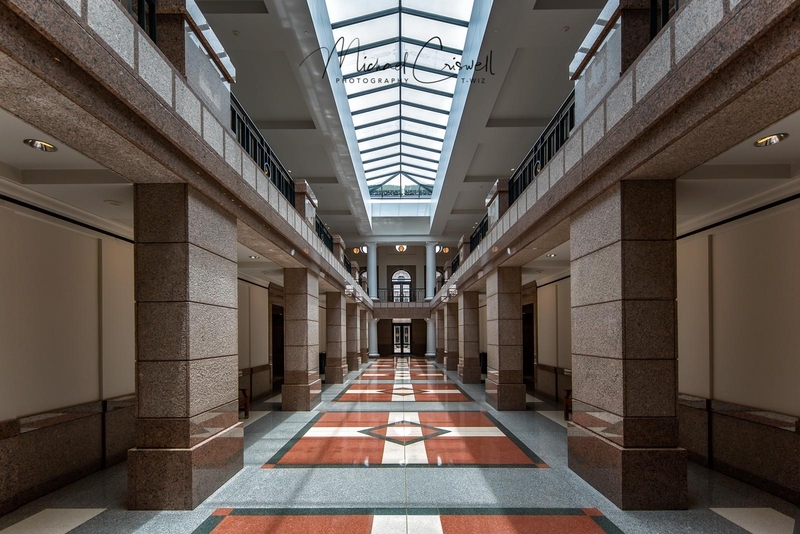 This entry was posted in Austin, Texas and tagged Austin Texas, Capitol Building, Capitol Extension, Congress Ave, Michael Criswell Photography, State Capitol, Texas Government, Texas State Capitol, Theaterwiz, Theaterwiz Photography. Well done! Makes me want to go back there sometime soon and shoot more. However, I will wait until after this session.